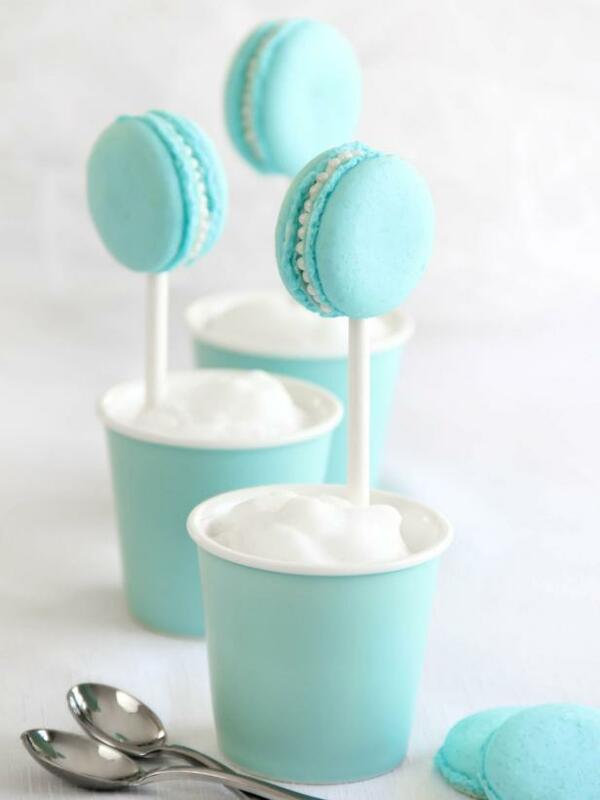 These Tiffany Blue macarons are perfect for dressing up a dessert table, or for packaging in little boxes for wedding favors. Sugar pearls are available at most grocery stores, or find them in the baking aisle at craft stores. 1. Preheat oven to 375 degrees F. Line two baking sheets with parchment. 2. Sift almond flour and confectioners' sugar together 2-3 times. Set aside. 3. Whisk egg whites with a hand mixer until foamy. Add cream of tartar and beat until soft peaks form. 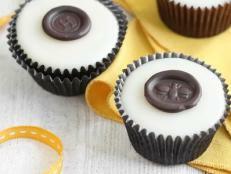 Reduce speed and gradually add extra-fine sugar. Increase speed and beat until stiff peaks form. 4. Sift flour mixture over whites with a fine sieve. Discard any lumps or coarse bits that remain. Fold mixture together with a rubber spatula — using short strokes at first — until just combined. The batter will be very stiff. 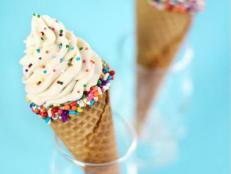 Place a small amount of Wilton Sky Blue gel food coloring on the end of a rubber spatula. 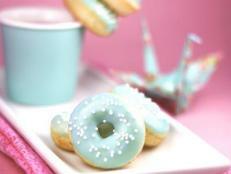 (Note: Powdered food coloring is more commonly used for macarons, but a small amount of gel does not disturb the batter. Liquid food coloring is not recommended.) Use bigger folds once batter loosens. When batter is ready, it should fall from the spatula in a thick ribbon. 5. 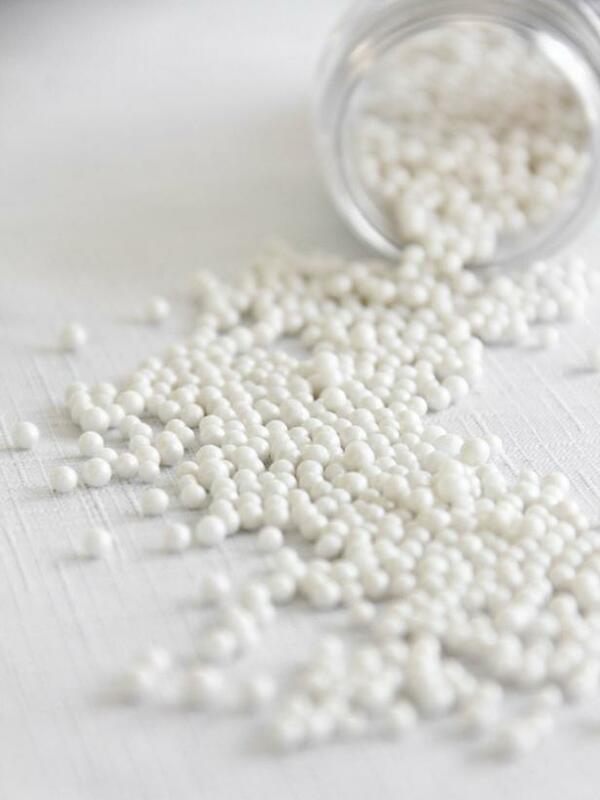 Transfer mixture to a piping bag. Pipe 1" or 1 1/2" rounds on the parchment-lined baking sheets. 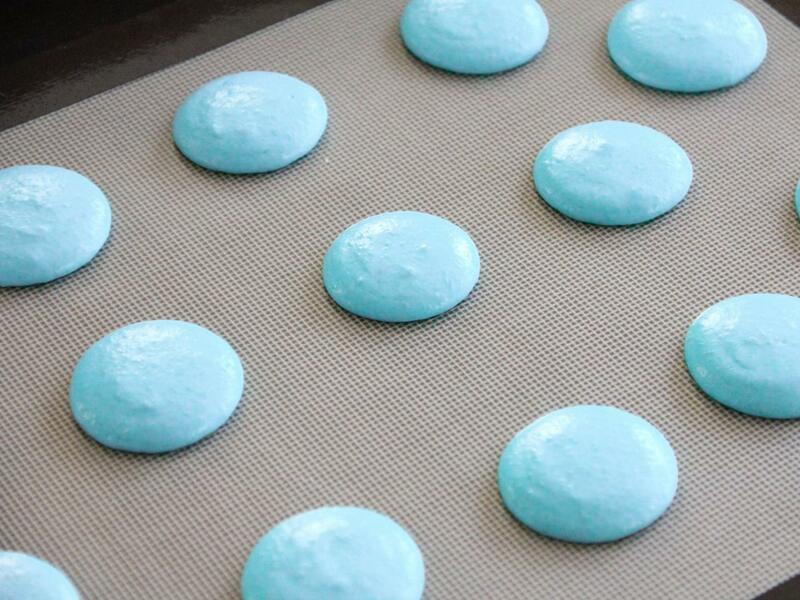 Let piped macarons stand uncovered for 15 minutes to form a crust (Image 1). 6. Decrease temperature to 325 just before placing the baking sheet in the oven. Bake pans one at a time for 10 minutes, turning halfway through. Note: After first batch has baked, oven temp should be increased to 375 then decreased to 325 just before the second baking sheet goes in. These macarons take on their Tiffany Blue color by adding Wilton Sky Blue gel food coloring to the recipe. 1. Cream butter and confectioners' sugar together in a large bowl using a hand mixer or stand mixer. Beat on high speed until light and fluffy. 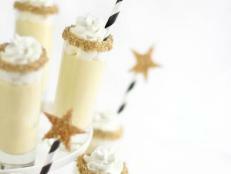 If mixture is stiff, use 1 or 2 tablespoons of cream to loosen. 2. Add orange blossom water in small drops. Beat until flavor is thoroughly incorporated. 2. 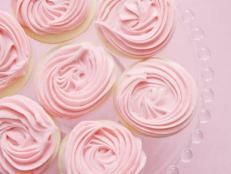 Using a new pair of tweezers (or baking-dedicated tweezers) press a line of pearl dragees (Image 1) into the buttercream. Enjoy your handiwork (Image 2)! 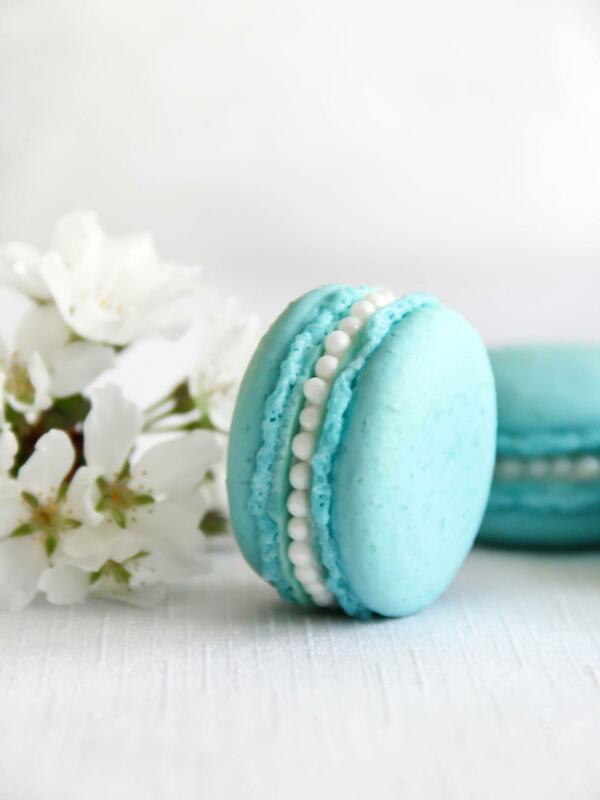 These pearl dragees add a beautiful finishing touch to Heather Baird's Tiffany-Blue Macarons With Orange Blossom Buttercream Recipe. The finished product after adding a line of pearl dragees to the exposed orange blossom buttercream of these Tiffany Blue macarons. 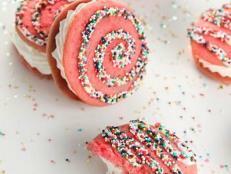 These sweet morsels are as pretty as they are tasty. 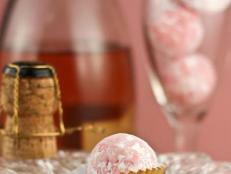 The bejeweled effect is achieved by rolling the truffles in pink sugar pearls. These vanilla bean sugar cookies would be a delicious addition to any wedding dessert table. 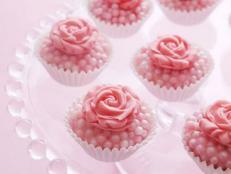 Adorned with swirls of pink cream cheese frosting, they look like beautiful roses. 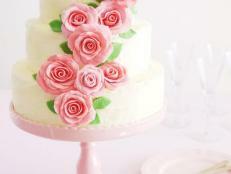 Making your own wedding cake sounds like a daunting task, but even the simplest home-baked confection can look professional with these beautiful, edible blooms. 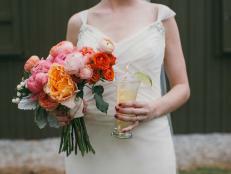 We realize selecting your signature wedding drinks is a daunting task, but there's no need to get your veil in a wad! As always, we're here to help.